We pulled together some recipes for you to try whilst this versatile leaf is in season. Find out more about spinach below. Although spinach is available all year round, April through to September is the best time to get the most out of this green leaf. 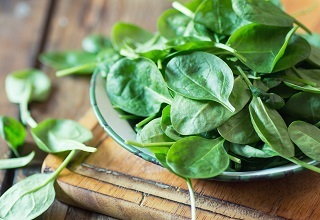 Spinach is rich in iron, a good source of vitamin K, A, C and folate as well as a notable source of B2 and magnesium. whilst this iron is harder for humans to absorb compared to animal sources of iron it is still a good source of iron for vegetarians to include in their diet. Vitamin K is a fat-soluble vitamin that plays a role in blood clotting, bone metabolism, and regulating blood calcium levels. There are three varieties of spinach. Baby spinach, which is often available in the supermarket is picked earlier because the leaf is sweeter and more tender. Be sure to wash spinach, but this leaf does not need much preparing and baby leaves can be eaten raw in salads. Spinach can be used in stir fries (2 mins), roasted (8 mins), steamed (3-4 mins). Another way of preparing is pouring just-boiled water over the spinach in a colander, refresh the spinach with cold water and then squeeze the excess water from the spinach through the sieve. This can now be used in rice, pasta and other dishes.